El Teide Volcano Park - it's a moon-like volcanic landscape on the island of Tenerife. The last 1200 meters of altitude we are conquering in the similar modern way – by the cable-car, bringing us in 8 minutes trip to about 3555 meters above the see level. Thin air slows motions and there is no famous “coca-leaves tea” so abundantly served at similar altitudes in Peruvian Andes. Fortunately nature comes in rescue – the stunning beauty of an endless panorama of the Archipelago of Canary Islands unfolding like a 3-D picture increases the heart rate raising the amount of oxygen in the veins. Walking the paths around the upper station, I’m discovering lava formations of fantastic shapes and forms – like not from this world. 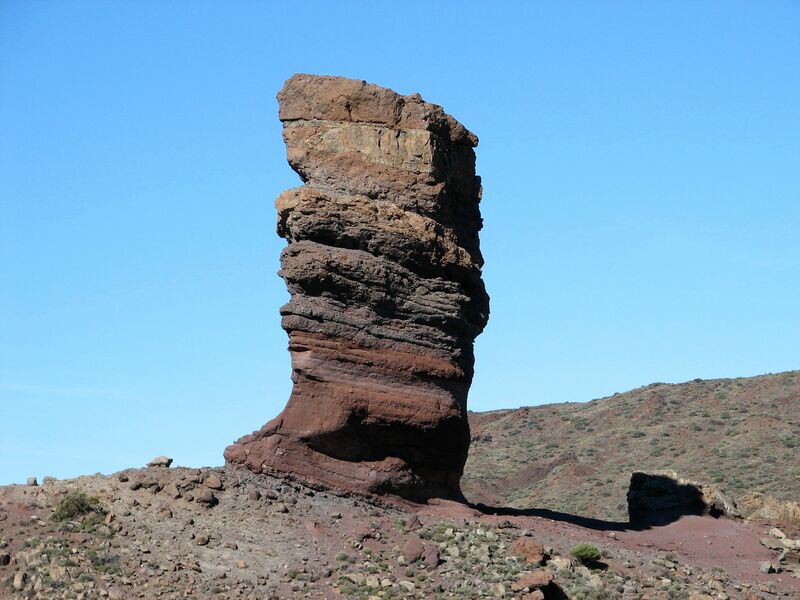 Each one could be easily claimed by masters of Rodin’s caliber, yet in this case all of them are made by the same hand – resourceful and unparalleled hand of Nature…..
On the left - El Teide's cone from close. Lunar landscape created by the forces of volcanic activity then re-shaped by the Mother Nature. On the northern side we found small amounts of snow – making me think that the popular postcards showing the whole massive of El Teide in white cover of snow may be real instead of “Made in Photoshop” even if snow falls here probably only once in a blue moon. To my disappointment, the access to the summit – these mere extra 200 meters of altitude – is restricted only for those having special permits. Lonely Witness of the violent forces from the remote past. Protection, Protection and once again Protection of nature that otherwise will be devastated by the hordes of backpackers including myself. That helped me to cool down and having that in mind I even restrained myself from taking few pieces of lava stones as a souvenir from El Teide. Who knows? Queen of Fire may not only be jealous but also a vengeful being… well, at least that is what I learned when conquering the Hawaiian volcano of Hayelakala. You will witness unforgettable scenery that the Mother Nature created in this part of the World!